Maple with ebony top banjo bridges in a variety of heights. These bridges have a string spacing of 1-11/16". Find bridge placement for any scale with our free online tool fret position calculator. 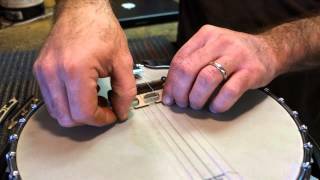 Dave Collins at Herb David Guitar Studio in Ann Arbor, Michigan shows an easy-to-make tool for swapping banjo bridges. Exactly what I ordered and received in a timely matter. Good bridges, I have used before, that is why I buy them. Bridge fit and works well. It was packaged well and arrived undamaged. I have been using these bridges for the past year and a half. Been trying different heights while tinkering with set up. At half the price of Grover, they are a winner! I have used these before, very good. I needed a quick fix for a warped banjo bridge, this bridge solved that issue and priced right! I ordered this bridge to replace the one that went missing when my 100+ year old banjo was being restored. The bridge is beautifully made and looks just right. Well made and good performance for the money. The banjo bridges were great. Just what I needed. Thanks.